This post will unabashedly focus on what Miss Bates loves about Neels, or at least this Neels … about what she hates, she’ll, like Nick, for now, “reserve judgement.” For many, Neels is a romance reader’s “restorative niche,” (thank you, Dr. Little), the effortless place where we re-new our love of the genre, a place where we turn a blind eye and adopt an attitude of receptivity. Come on, Betty who is the nonpareil, “charm me,” we say. Miss Bates loves La Neels’ no-nonsense, hard-working, firmly compassionate heroines, unafraid to speak their minds, competent, briskly efficient, and good at what they do. A little cool, a little brusque in manner, as Augusta is, their sentiments are often oh-so-right; witness this exchange between the experienced Sister Cutts and Augusta, ” ‘Nursing is hard sometimes, is it not, Nurse Brown?’ … Augusta knew what she meant, it wasn’t the long hours and tired feet or hurried meals to which she referred, but the hardness of not being able to help.” Neels is unique among many romance writers in truly capturing the rhythm of the work day/week, its tedium and rewards, the daily pettiness and the hard satisfactions of being a working woman in one of the “helping professions.” Her portrayals are tender with our heroines’ delight in a new outfit, or hand-bag … the working woman who holds the hand of the ill, the dying, the frightened and, at the same time, finds happiness in simple, harmless pleasures: a good cup of coffee, a week-end in the country, and a restfully long nap! Miss Bates just loves these spinster-ish comforts. Indeed, if not for mysterious, protean Dutch doctors, Neels’ heroines would remain spinsters BECAUSE THEY DO NOT SETTLE. There. In the hospital room of a imperious elderly gentlewoman, Lady Belway, Augusta encounters the Lady’s godson, Dr. Constantijn van Lindemann and a beautiful young woman, Susan Belsize. Belsize is the “other woman;” there is always an “other woman” in Neels, who is conveniently dismissed by the end of the romance novel. EXIT: “other woman.” A little MissBatesian snark sets in here because Miss Bates hates the device of the “other woman.” She’s a little skimmy negligent when reading these bits … but this post is more Neelsian paen than snark, so Miss Bates will let the criticism stand, but desist from hereon. Constantijn van Lindemann is typical of the Neelsian hero. He’s wordly, winking, teasing, challenging, and utterly, charmingly unknowable. POV in Neels is strictly of the heroine variety and Miss Bates loves it; not to sustain a permanent diet of it because she enjoys forays into heroes’ minds, but this is good too. What Miss Bates finds most interesting about a Neels hero is not only that he is a cypher, but that he seems, from the moment of encountering the heroine, to possess knowledge she does not. One of the first things that Constantijn says to Augusta is, “I was beginning to think that you didn’t like men. Of course it’s a blow to my ego that you don’t like me, but that is something which can be dealt with later.” The assumption is that there will be a “later” when the heroine realizes something that the hero knows instantaneously: that they will be together, will marry. The hero bides his time, waiting for the heroine to reach an epiphany that he had the first moment he met her. (Constantijn attributes this to “fate,” which, judging from Miss Bates’ post regarding this element in romance fiction, could serve for a whole other post on La Neels and Augusta’s tulips.) Similar to Neels’ heroines, heroes are no-nonsense. They are brusque and don’t suffer mincing misses. They like their women stalwart, hardy, and self-sufficient. Signs of missishness are derided and promptly squelched. Constantijn is as brusque and cryptic as any Neels hero and as given to the mysterious given that he knows something the heroine doesn’t. But Constantijn does not leave Augusta totally without intimation of his feelings; he doesn’t utter them, but gives/sends her TULIPS. The first time, he hand-delivers them with, ” ‘These are for you – tulips for Miss Augusta Brown, because the sun has shone all day, and I doubt if she has encountered even one sunbeam.’ ” Aw. She has had a long day in the ward. Finally, when Constantijn accompanies Augusta to her village jumble sale and notes her disappointment over the loss of a china figurine and a beaded pincushion from the white elephant table … lo and behold, it’s because he’d bought them for her. They are delivered to her room the next day. New flower bouquets follow, each more sweet and endearing. La Neels really takes to heart and enacts in her hero the idea that gesture is more significant, more lasting, and more loving than florid declaration. Constantijn, and his name is indicative of what kind of husband he’ll make, rescues her, motors her, wines and dines her on oysters, and steak, and Crême Waflen. The day after she accepts his proposal, ushering in a new era in their lives, he sends sweetpeas! As Miss Bates wrote this post by way of appreciation, her final judgment may not be in keeping with what came above, but if you’ve read Neels, then you know there will be things in this for which you’ll have an “unaffected snorn.” Yet here is “a mind lively and at ease,” Emma. Miss Bates purchased an e-book of Neels’ Tulips for Augusta from one of the usual places. She’s inserted the new cover above, but loves this one from the original publication in 1971. Have you read Betty Neels? This is Miss Bates’ third and she’s sure to want to read many more. (Whew, La Neels wrote 134.) What Neels have you read and enjoyed? What aspects of her novels do you love and for what elements do you have an “unaffected scorn”? If you’d like to read a great treatment of Neels and issues of scorn and love and feminism, check out this great post at Badass Romance. You’ve captured everything I love about the Neels formula here! And yes, many things about her books should not be to my taste, yet I love them. As far as ones I prefer, the Junoesque nurse heroines are much better than her waifish non-employed heroines. But there is almost always an unknowable doctor hero and an extended trip to Holland (and a rescue by said hero)–even though I know exactly what will happen, she still charms me every time. Thank you for the lovely comment! I’ve been thinking that the Neels sensibility wins, hands down, over the “elements.” It’s so interesting how things that Miss Bates’d hate in other romance novels, she forgives most readily in Neels. She’s wonderful and Miss Bates is sticking to that. Miss B. has read one of the waif-heroine variety, but can’t recall the title. It’s true the heroine was not as loveable as the crabby Augusta, but the doctor, the pets, the food, great: sinking into a Neels romance, it’s like putting one’s feet up after a long, tiring and not very successful day. So glad you shared your thoughts about Betty Neels! 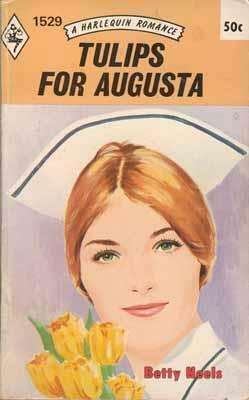 Tulips for Augusta is a typical Neels – very enjoyable and worth reading with all the issues you mentioned (and a few more, probably). I don’t think you’ll go wrong reading any of her 134. However, there are some standouts from the typical Neels formula and I’ll list them here. I have appropriated the term RDD (Rich Dutch Doctor) from the reviewers at Uncrushable Jersey Dress. They are hilarious and their reviews have added to my enjoyment of Neels. The Hasty Marriage – angst fest. Laura, (almost 30) a competent surgical nurse, falls in love at first sight with the visiting RDD who promptly falls in love with Laura’s much younger, much prettier sister, Joyce. When Joyce breaks their engagement, the surgeon marries Laura out of revenge? Despair? Then the story really gets started. Hero is a stinker – but there’s a great grovel at the end. Lots of twists and Harlequin Presents-type turns. The Secret Pool – omg – angst. I don’t even know if you could call it a romance, but it’s such a heart-wrenching story. Rich Dutch Doctor (RDD) meets sweet, kind nurse who looks just like the mouse bride in his dying daughter’s favourite picture book. They embark on a marriage of convenience for the dying daughter’s sake. It is beautifully written, imo and I didn’t find it emotionally manipulative, but some readers might. Caroline’s Waterloo – young nurse breaks her ankle in a biking accident in front of a RDD’s house. He is grumpy. She is cheerful. She wins the hearts and minds of all his servants during her convalescence at his house. It’s adorable to watch him fall for her. The Promise of Happiness – opens when Becky, a trained nurse who has been living a life of indentured servitude with her stepmother and stepbrother, is picked up by Baron Tiele Raukema van den Eck (or the hot, hot Baron as the reviewers at the Uncrushable Jersey Dress dub him) as she runs/walks away from home. Her stepbrother had threatened to put down her cat and dog. He promptly hires her to accompany his mother on a cruise to Norway. (As you do) and then the story begins. She is a Jane Eyre character – flat-chest, skinny frame, passionate, and not afraid to speak her mind even when it enrages Tiele. They are such a fun pair. 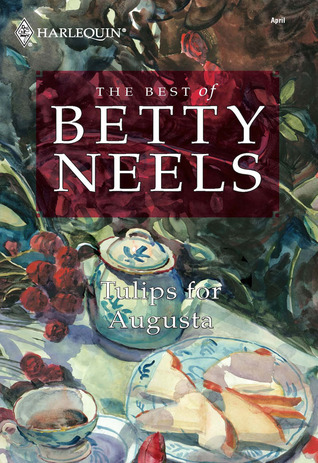 I think this is my all-time favorite Betty Neels, but I couldn’t do without the others on this list. Hugo is the RDD. Sarah is a competent nurse who has worked for him for a year or so and has no clue he has any interest in her whatsoever. When her fiancé dumps her, Hugo makes his move and proposes a marriage of convenience. Hugo is a sweetie. The story goes on from there with some great side characters. You really believe in them as a couple by the end. Takes place in the Hebrides and Holland. Blind hero (temporarily). Sanctimonious vicar. Two cute kids. One really funny scene with the vicar and the hero. The second half of the book isn’t as engaging, but it’s still a fun read. Stammering student nurse, Arabella, meets RDD after a bus crash. He is charmed by her, but enter Arabella’s beautiful older sister who immediately takes all of his attention. Hero is a sweetie. Her family is wonderfully toxic, even though loyal Arabella can’t see it. Wow, what a great list and so succinctly and delightfully written. Miss Bates loves it and humbly thanks you! She hopes that visitors to Miss Bates take full advantage of your wonderful recs. It has certainly sent Miss Bates scurrying off to check the Betty Neels TBR … & Miss Bates has all but The Secret Pool and Fate Is Remarkable. It felt so good to hit the buy button on the Kindle, but Fate Is Remarkable isn’t available. Sniff. Miss Bates read her first Neels thanks to the ladies at the TUJD, so she agrees when you salute what they’ve done for Neels and her readers. And yes, with great humour and as fun to read as Neels herself. Since category is all about tropes, I thought I should at least give you the set-up of each novel so you could decide what appealed to you. I’m envious you get to read these for the first time! Oh, yes. “Unaffected scorn.” Well, after you’ve read all 134 you really get to know Betty’s fall-back plot devices and stock characters. Confession time: I kind of love to hate the materialistic, cold-but-beautiful other woman and the selfish mothers and the scheming sisters even though I know I’m letting down the sisterhood. I comfort myself with the knowledge that there are a lot loving mothers-in-law, kind fellow nurses, and Cockney landladies who help the heroine in the canon. But – hello there, conflict – it’s fun to read a scene-chewing other woman and the heroine’s reaction. Betty’s insistence on giving exact directions for wherever the RDD is driving is the quirk that bugs me the most. I imagine I could take a tour of Holland or GB armed with nothing but Neel’s novels. There seemed to be more of this in her later novels, which are delightful in there own ways, but lack the emotional punch of her earlier works. She does give the hero’s thoughts in later stories – not a lot and they are almost always about how bowled over he is by the heroine. Very sweet. Miss Bates loved your defense of the “other woman” trope. It was so witty! And she’ll reconsider those scenes, as a result. It’s because she never recovered from the “other woman” trope in The Sound of Music. As a matter of fact, there’s much about that film to remind us of our beloved Neels. Miss Bates didn’t know any of the details of Neels’ own life and how hard it was at times; maybe, yes, that’s why she’s so good at capturing the pleasures of a new dress, hand-bag, and … the food! It always has Miss Bates scrabbling for the Google images button and recipes. And no scrimping on the butter and cream … hurrah! I’m gradually getting all the Neels from the Mills & Boon UK site. The full set are available now. Miss Bates would say that she now has about half, with some ratty paper copies picked up at church basement sales. Doesn’t it feel great to have them? And isn’t it great that La Neels was so prolific? Happy reading to you!! This lovely post perfectly captures my feelings about Neels. Yes, there are irritants, but the pleasures, and the voice and sensibility, more than make up for them. I feel somewhat the way I do about the Susan Elizabeth Phillips books I like: when I reach the end, I look back and think, “hang on, I can’t believe I enjoyed that so much, because X, Y and Z should make me crazy!” I’ve read three too, and I plan to read more. I liked the first half of Cassandra by Chance very much, and found the second part more frustrating. Betty, her (still very incapacitated) husband and small daughter wound up in Holland after WWII ended. Betty was the main wage earner–as a nurse. So all those scenes in her books where her heroines are struggling to learn Dutch are straight from her life. That fact of being the main wage earner also sets the stage for all those wish fulfillment stories where the incredibly rich doctor sweeps in, taking over her worries. No more sums on the back of envelopes! No more buying a new wardrobe piece by piece, pay day by pay day. No more brown (whatever) because it wears well!! Even after the family moved back to England, she held the higher paying job. The second main thing to look for/remember is that Betty retired from nursing in the late 1960s. Her early books could include very detailed medical/nursing info because the author was not long separated from the work. But the longer Betty was away from nursing, the more vague the medical jobs became. There were many lively discussions over at TUJD about the (non-realistic) helplessness of some of the very later Neels heroines. Note to Mary: Betty was never stationed in Holland. She met her husband to be while a nurse in Northern Ireland. Note to Liz Mc2–that is the reaction of a lot of Betty fans. The first half of ‘Cassandra by Chance’ is soooo fine and then the second half falls into the whole “I may be blind, I must turn away this fine woman, etc, etc, blah, blah. blah”. Note to Miss Bates–full disclosure–over at TUJD I’m known as Betty Barbara–commenter, sometime contributor. And very long time Betty fan. Note to all readers who are interested in Betty Neels– the Founding Bettys (Debbie and Keira) have written some of the greatest book reviews/synopses over at The Uncrushable Jersey Dress. Please, go over and browse the site. It’s fabulous! Welcome Betty Barbara and thank you for the fabulous comment and clarification. TUJD is what got Miss Bates interested in reading Betty Neels and the reviews are most definitely lovingly tongue-in-cheek and yet thoughtful and appreciative of her. We do love her so. And learning so much … Miss Bates hopes TUJD will continue to pay homage and entertain and keep the Betty-Love alive. What a delightful post, and comments… I have to try this one, you make it sound so charming. Thank you! Miss Bates hopes you do give it a try, or the other one Miss Bates liked a lot: Visiting Consultant. Enjoy! She’s planning to read from Neels’ early work to her late! I’m pleased to find your site — I must go back and thank the person who tweeted it. My favorite Neels is “The Course of True Love” — I adore the hero, Marc Van Borsele, who I find to be a lot of fun. If you want to read a Neels where the hero REALLY doesn’t tolerate missishness, you’d probably like Tabitha by Moonlight.